All workers deserve to be compensated with wages upon which they can thrive. Last week, the day after the November election, Environmental Justice Chair Jun Shin and YPDA Co-Chair Will Caron joined members of the Sierra Club of Hawaiʻi, the Hawaiʻi Alliance for Progressive Action, and the Democratic Party of Hawaiʻi at the UNITE HERE! Local 5 picket line outside the Sheraton Waikiki, a Marriott hotel. 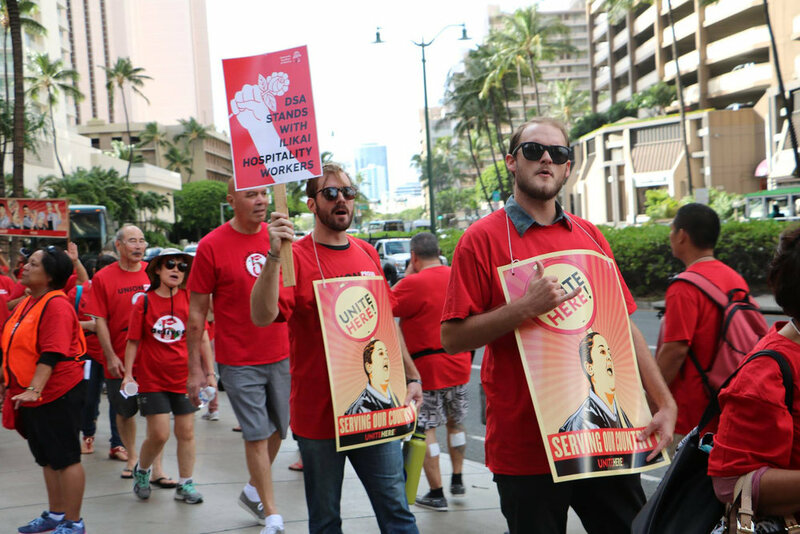 This comes after other allied groups like the Democratic Socialists of Honolulu and Academic Labor United expressed their support for the striking workers as well. Young Progressives Demanding Action (YPDA) represents more than 1,000 active and engaged community advocates and citizen activists living and working throughout Hawaiʻi. The majority of our members are under 30; many struggle to survive working in the hospitality industry here in the islands. We believe in the promise of a Hawaiʻi where every single person has the opportunity to fulfill their potential. We believe in a future where one job is enough. We support UNITE HERE! in its strike and in its larger struggle for workers’ rights. We know the value of our labor, both to ourselves, and to a global, interconnected economy. We know that—in a time of unprecedented wealth and economic activity—productivity and profits continue to rise, while wages for the workers who build that wealth and who generate that activity remain stagnant. We know that this scarcity is artificial and designed to prevent the equitable distribution of this wealth to all the laborers involved in its creation. We know that an organized labor force is the only viable way to change this dynamic. And change, we know, is a must. As members of the Millennial Generation and Generation Z, we worry about what the future will look like for our children and our grandchildren should the wealth gap continue to widen, should the climate continue to be threatened by over-industrialization, and should the social structures that support our society fail to adapt to things like automation and a continued shift toward gig labor and digitization. We refuse to sit by and watch as economic and political elites continue to make decisions that worsen these trends with zero thought for the consequences to future generations and to the health of the planet. Unions like UNITE HERE! are driving the movement for a better tomorrow for all of us. Unions promote fairness in the workplace, giving all workers a stronger voice on the job. Unions promote economic prosperity for the working class, which in turn floats the entire economic system. And unions encourage participation in the workplace community and the community at large, strengthening the ties that make our communities special. This is a movement that affects all of us, and so we stand with our fellow laborers in demanding a fair and equitable distribution of the fruits of our combined labor. This is about more than just wealth though. This is about demanding the recognition that workers are human beings, not cogs in a corporate machine. Workers are humans deserving of dignity, respect and a life worth living—where work is an integral part of who we are, but it does not define or consume us. This is about worker’s rights. And worker’s rights are human rights. We therefore urge you, The Management, to recognize the humanity in this struggle and—rather than seeing yourselves on the opposing side from workers in a mad scramble for wealth—see yourselves as fellow humans that want their brothers and sisters to not just survive, but to thrive. See the changes coming—like automation and digitization—not as ways to cut costs, but as opportunities to lead your workers into new and uncharted kinds of productivity. And see the unprecedented wealth we have, and will continue to generate, together, not as something to be hoarded, but as something to be shared with and enjoyed by all. That is how we, as a human society, will continue to grow and achieve our great collective potential. We urge you to recognize the legitimacy of the UNITE HERE! strike and of the demands of the union. We urge you to see the value in providing workers with the benefits they both deserve and need to do their jobs well. We urge you to be forward-thinking and visionary in your approach to labor and the global economy; to be trend-setters and harbingers of a better future, just now beginning to crest over the horizon. We urge you to do your part in creating the future Hawaiʻi—and world—that we all want our descendants to live in: where one job is enough for us all, and we all enjoy the dignity and respect we deserve in our labor.